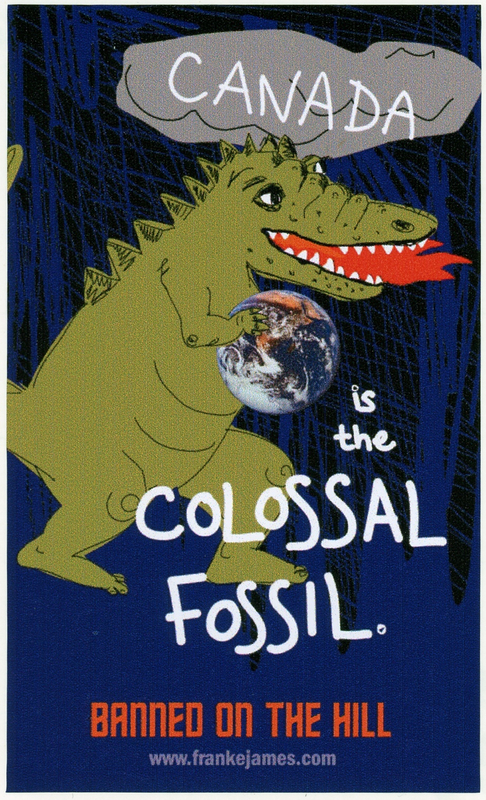 Cartoon illustration of big fire-breathing dinosaur carrying the Earth like a bouncing ball. The artist, Franke James, is a Canadian author and climate activist and whose work became the subject of controversial government scrutiny and censorship led by the country's conservative Prime Minister Steven Harper. She describes her experience in the book Banned on the Hill: A True Story about Dirty Oil and Government Censorship (2013). "Canada, under the government of Stephen Harper, has exhibited little patience for dissent. The government has muzzled government scientists, insulted NASA climate experts, and dismissed environmental protesters as dangerous radicals. But there is apparently one woman whom the government can't shut up: the Toronto environmental writer, illustrator and activist Franke James, who turned the efforts to silence her into material for a new book. Banned on the Hill: A True Story about Dirty Oil and Government Censorship shows how Canadian bureaucrats tried to silence James because her views on climate change clashed with the Harper government's push to develop Alberta's tar sands. The story is told through visual essays as well as official emails obtained by James, in which government bureaucrats discuss the troublesome artist and her work." For more from the Guardian's article, "Artist finds inspiration in Canadian government's attempt to silence her," see http://www.theguardian.com/environment/2013/may/17/artist-inspiration-canada-silence-climate.